The “Partnership Dialogue” is divided into three working groups, which will meet again early next year: (1) Human Rights and Good Governance; (2) Energy; and (3) Science and Technology. The choice of topics is remarkable for the absence of “Drugs,” which has been the dominant theme of U.S.-Colombian relations since the 1970s. In fact, this new rhetoric about “partnership” and “equal footing” tells us that levels of U.S. aid to Colombia are going to continue, and probably accelerate, the decline that began in 2008. (After all, aid donors and recipients, by definition, are not “equal partners.”) This autumn, the Obama administration is finalizing its 2012 foreign aid request to the U.S. Congress, which it will submit in February. In our own informal discussions with administration officials, we have heard several indications that the 2012 aid proposal will include a significant cut for Colombia. It is a big enough change, in fact, that we can consider the Steinberg delegation’s “re-launching” visit to be the unofficial end of the “Plan Colombia” era in U.S.-Colombian relations. Amid the talk of “partnership,” the relationship has also grown a bit more distant. The Democratic Party majority in the U.S. Congress, citing human rights concerns, has kept the 2006 free-trade pact in the freezer. 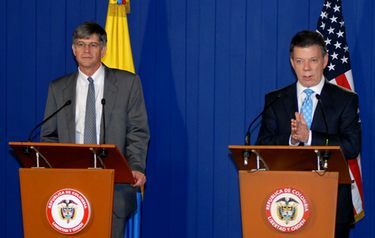 After Colombia’s Constitutional Court struck down a 2009 defense cooperation agreement with the United States, requiring that it first pass through Colombia’s Congress, President Juan Manuel Santos indicated to congressional leaders that he would not submit it to the legislature, which effectively renders the agreement null and void. None of these problems has been vanquished. The guerrillas are not defeated, and won’t be beaten on the battlefield for at least several more bloody years. The “new” paramilitaries are growing, and responsible for an alarming spike in urban crime. Colombia is still the world’s largest cocaine producer, and drug mafias continue to enjoy great political and economic power. Meanwhile it is extremely rare to see a human rights abuse punished or stolen land returned to victims. Thanks to a column by Hernán González Rodríguez in today’s edition of Medellín’s El Colombianonewspaper, we found a very useful document (PDF) on the website of Colombia’s Treasury Ministry. 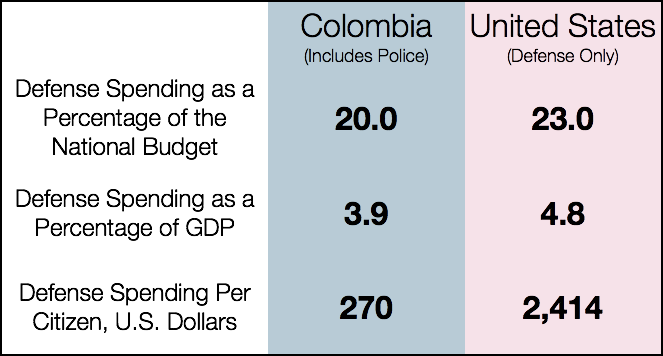 It breaks down, according to function and institution, the Colombian government’s budget for 2010, and what it expects to spend in 2011. But U.S. citizens bear an even higher military burden, as indicated in the White House’s budget estimates for 2011 (go here [PDF] and look at “Table 3.1—Outlays by Superfunction and Function”). Unlike Colombia, this figure does not include police forces, who are scattered across thousands of state and local jurisdictions and impossible to add here. 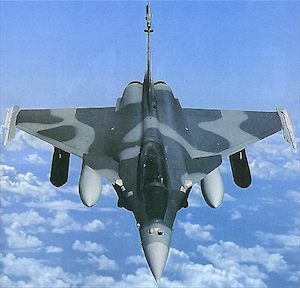 Brazil will buy 36 Rafale fighter jets from French aircraft manufacturer Dassault. Earlier, Brazil had announced a joint venture with France to build submarines – one of them nuclear-powered – and helicopters. Russia offered a $100 million credit to Boliviato buy Mi-17 helicopters, a new presidential plane, trucks and other logistical equipment. In January, Bolivia’s defense ministry announced its intention to buy six Czech-made L-159 fighter planes. President Hugo Chávez of Venezuela, whose government signed deals for about $4.4 billion worth of Russian fighter planes, helicopters and rifles between 2005 and 2007, announced in early August the purchase of 30 to 40 Russian-made BMP-3, T-72 and MPR tanks. In April, Chávez announced the purchase of portable Russian missiles. “Ecuador is buying 24 Brazilian warplanes and six Israeli drones to keep a closer watch on its borders,” the AP reports. In June, Chile announced a $270 million purchase of 18 U.S.-made F-16 fighters from the Netherlands. This follows the purchase of 10 F-16s directly from the United States in 2005-2006. In addition to billions of dollars worth of training and equipment received as grants, Colombia has purchased dozens of helicopters from the United States during the 2000s, and in June announced a $150 million purchase of Israeli Kfir fighter jets from Israel. During the mid-2000s, the United States normally sold between $1.1 and $1.4 billion in weapons to all of Latin America and the Caribbean in a typical year. This amount is dwarfed by some of Russia’s single sales to Venezuela during this period, as well as the new French contract with Brazil. Sill, the United States is by far the largest arms vendor to the developing world, according to an annual Congressional Research Service report released late last week and summarized by the New York Times. The combined defense budgets of South American states increased from US$39 billion in 2007 to US$50 billion in 2008. Most countries have become buyers in the new market for arms, some are sellers, and nearly all are furtively examining their neighbors’ actions. The Ecuadorian government took a step toward spending transparency with the elimination of the Junta de Defensa. The Junta was accused of embarrassing gaffes like the Defense Ministry overpaying for used Argentine defense articles, as it did in 1995. Some feel the government’s action amounts to little more than a token gesture. President Correa has meanwhile overseen a large increase in defense spending. From 2000 through 2008, Ecuador spent over US$895 millionon Defense. During Correa’s time in office, since January 2007, the Defense budget soared over US$631 million – over 70% of the nine-year spending total in just two years. Argentina has not put nearly as much money into the military as its neighbors, claiming a Defense budget of only 0.87% of its 2008 GDP. The Air Force has put off purchasing French Mirage fighter aircraft until 2011 or 2012, when it will reevaluate the economic climate. Today, the country’s most pressing Defense concern is keeping troops in its Armed Forces. Unlike other countries that are considering increasing military capacities, Argentina is concerned with maintaining them. A recent study found nearly half of all individuals in the Armed Forces have considered leaving within the last two years, including a substantial number of young pilots and officers who have left to seek better opportunities, for better pay, or to keep their families intact. Some Argentine analysts appear distraught about falling behind “international heavyweight” – and neighbor – Brazil. In December, President Luis Inacio Lula da Silva announced Brazil’s plan to upgrade its military and arms industry. Part of the plan includes training soldiers in rapid mobilization and guerrilla tactics, and the government wishes to resurrect conscription. While the plan includes purchasing foreign arms, the modernization’s focus is for the country to increase its domestic arms industry. Brazil has ordered 4 diesel-powered Scorpène class submarines from France, but plans to develop its own nuclear-powered fleet, at a total cost over US$3 billion. The plan appears to be both financed by, and in the name of protecting, newly found Brazilian offshore oil reserves. Over the last several months, Brazil has consolidated its position as the largest South American arms vendor. Bolivia recently negotiated the purchase of Brazilian land vehicles and Super Tucano attack aircraft, and hopes to borrow from Brazilian institutions to fund additional purchases. Bolivia has also acquired several helicopters from Russia. Venezuela’s Defense budget is 1% of its 2008 GDP, but growing steadily. It has been cultivating a relationship with Russia through arms purchases over the last several years. From 2005 through 2008, Venezuela bought over US$4 billion in arms and equipment from Moscow, and a September announcement revealed another US$1 billion credit for more purchases from Russia. 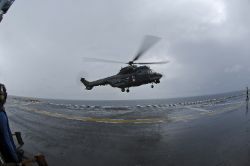 Peru has decided to install two facilities capable of repairing Russian-made helicopters, clearly setting the stage for future purchases between the two nations. While this particularly animated editorial in El Comercio questions the drive to increase Defense spending, much of the discussion centers on keeping pace with Chile, which maintained a 2008 Defense budget of 3.73% of its GDP, second only to Colombia in South America. Colombia has more than doubled its defense expenditure since 2000. The Defense Ministry’s budget, which includes police, now exceeds 6 percent of GDP. U.S. security assistance to Colombia is slightly less than it was in the early 2000s, making the U.S. contribution to Colombia’s overall defense effort far smaller, as this July blog post from the Center for International Policy explains. Nonetheless Juan Manuel Santos, Colombia’s Defense Minister, plans to travel to Washington shortly after Barack Obama’s inauguration, to urge officials to maintain established levels of aid under the Plan Colombia framework.